For a long time, researcher have viewed black holes as ‘eternal prisons’ for all that is drawn into their endless depths. But from past whole year Stephen Hawking has been saying that there may be a way out. The famous theoretical physicist clarified these notions at the inauguration of Harvard’s Black Hole Initiative, initiating the program that will primarily concentrate on black hole research. The lecture was held at Harvard’s Sanders Theatre, where Stephen Hawking spoke for an audience of over 1,000 people. Hawking is currently the director of research at the Centre for Theoretical Cosmology at the University of Cambridge in UK, and from the past few years hawking has made some development on his theories on the ‘lost’ information that gets drawn into black holes. He proposes that this information may be kept in a different universe, and may not be vanished forever as is usually believed. With the help of Black Hole Initiative, Harvard scientists will join forces to ‘cultivate a sort of culture of people fascinated by black holes,’ said Chair of the Harvard Department of Astronomy Avi Loeb, The Harvard Crimson reports. This will allow professors along with undergraduate and graduate students to contribute in research and new study on black holes. 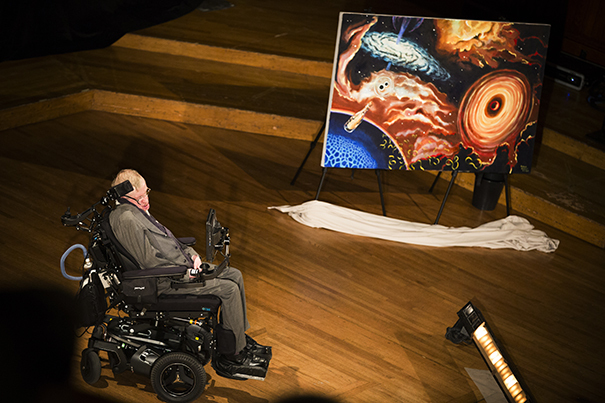 In his lecture, Hawking also talked about the recent discovery of gravitational waves. The theoretical physicist related the return of information to a burned encyclopedia, where information wouldn’t theoretically be lost, but would be extremely tough to decode. Black holes could be gigantic objects – as massive as the distance from the sun to Jupiter – Hawking explained, but that also leaves the possibility of black holes being as small as a mountain. This lecture tracks the current launch of Hawking’s $100m project, an alliance with Russian billionaire Yuri Milner and Facebook founder: Mark Zuckerberg, called Breakthrough Starshot. They have planned a project that on small so-called 'nanocraft' flying on sails propelled by beams of light through the space. This 'nanocraft' will complete its journey to the Alpha Centauri star system 25 trillion miles (4.37 light years) in twenty year to look for alien life.